Mind you, as I’ve noticed while driving here, it’s the kind of thing that comes up just infrequently enough that it’s possible to forget. How bad at driving are New Zealanders as a country, so you mentioned the fush n chups blog, well for an alternative view, consider a blog entry from the sitting duck blog which criticises the AA’s own arguments. Also two relevant episodes of the sitting duck podcast, eposide 158 driving social flip-flops followed by driving me crazy. The latter includes a whole section on the right-hand rule, again debunking claims about the dangers of this rule, saying that driver education is the real issue in New Zealand. 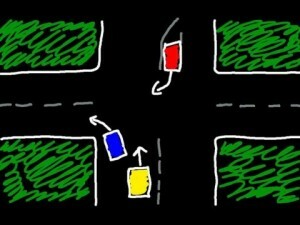 If you hate the left turn give way rule, what about right turn on red in North America. In United States and Canada, right turn on red is permitted virtually nation wide, except where a no turn on red sign is posted. Does this create a dangerous situations. One is, vehicle A is making a right turn (in North America where they drive on the right), the green light changes to amber, then red, so they need to come to a complete stop before turning. As the lights in the cross street turn green, pedestrians on the same side crossing in both directions also get a green signal. This means that when turning right (which would be a left in New Zealand) on a red light you must wait until the crossing and the road you are turning into are clear. But what if pedestrians continue to cross when the don’t walk signal has started flashing (which they probably shouldn’t), then while busy watching for pedestrians crossing against traffic, vehicle A might just miss vehicle B, going straight through on a green light with right of way. In New South Wales, left turn on red is premitted where signed but in all other states all vehicles must wait for a green at all intersections with traffic light, nice and simple, isn’t. Compare for example the UK and the US. On one hand the US does not have that many roundabouts and lots of traffic lights and generally permits right turns on a red light while the UK, which has lots of roundabouts and fewer traffic lights than the US, does not have an equivalent of right turn on red, which would be left turn on red, is that a coincidence? Thing is, I highlighted two specific cases where this rule is markedly less safe than the alternative. I also racked my brains to figure out how it could possibly improve safety and came up with nothing. The post you linked to really doesn’t address this. With the exception of enabling the right-hand turner to turn a little sooner (the majority of oncoming traffic is proceeding straight ahead so it’s not a huge difference), how does the rule improve safety? Edit: I must agree that left turn on red can create similar danger. It is only allowed in NSW on specific intersections though, and really is tangental to the right hand rule issue. The thing is, in one of the two cases, the pedestrains continuing to cross when the red man is flashing, which is dangerous and wrong anyway. The second is drivers misunderstading right of way. I have listened to the podcast episode I forgot to link to, the sitting duck podcaster mentions having had people pull around the left turners to go straight through and having never come close to being hit, why? He explains in the podcast. I’m not so sure that turns on a red light is tangential, left turn on red in NSW and the North American equivelant is another example of an additonal road rule most countries don’t have. And even here in Australia, you do give way to opposing right turning traffic when turning left from a slip lane. You can still turn left from a slip lane when the traffic light is red but give way to traffic going through a green light. 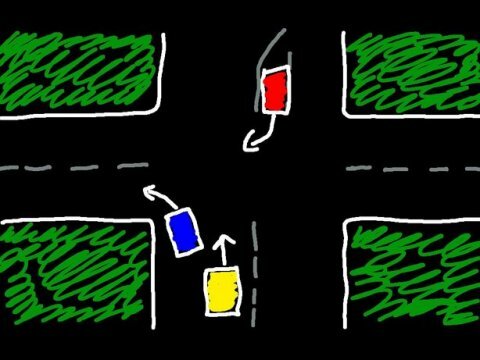 So left turn on red and the left turn give way rule do (seem to) have a connection. And how often do vehicles waiting to turn across oncoming traffic get (close to being) rear-ended? Could be a situation where reducing wait times could making things safer? We had the left-turn give way rule here in Victoria prior to national standardisation of Australian road rules. It was our dropping of this under national standardisation that left New Zealand the only country with this rule. An analogy, albeit hypothetical: Imagine if the Western US states adopted right turn on red, Caribean countries with right hand traffic following suit and then the western states dropped it (the Eastern states and Canada having never adopted the rule) leaving only Caribean countries such as the Domincan Republic with free right turns on a red light. I don’t really want to listen to a podcast just for the explanation. Could you summarise? I don’t think it’s as clear as drivers simply misunderstanding right of way. The optimal way for all three drivers to handle that situation is for the car behind to pull out and the left turner making the turn at that moment as the oncoming right turner is compelled to wait. It’d be much better if the left turner just had right of way in the first place so that the car behind needn’t expose themselves to oncoming traffic and the left turner needn’t be paying very close attention to what’s happening behind him as well as in front of him during the turn. A slip lane is simply merging with traffic, therefore you give way to everyone no matter where they come from. Basically what it comes down to as far as I can see is a cost/benefit on the unusual rule. If the rule causes more problems than it helps with, it should probably be changed. I also disagree (though with no evidence :P) that the left turn on red rule creates as much risk. 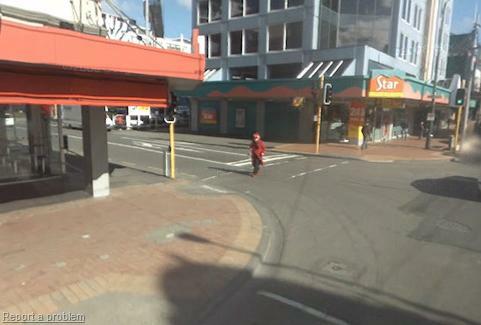 In the example you gave previously with pedestrians, the pedestrian would have to be crossing against a solid red signal – very dangerous. With the right hand turn rule, a pedestrian need only be completing their crossing on a red flashing signal, which usually appears once pedestrians are halfway across the road. This is a very common occurrence. In your hypothetical, it’d make sense for the Caribbean states to ditch the rule if it created more problems than it solved. What the US does about the rule probably doesn’t factor in – though if after they changed the rule their accident statistics improved, you’d probably want to consider that (as is the case with Victoria). I am probably the only one commenting who has listened to the podcast. No, the right turner should not expose themselves to oncoming straight through traffic, why? Becuase giving way means that the road user you are giving way to does not need to stop, slow down, brake, swerve or take any other evasive action to avoid you. Under the current rules, when turning right, you don’t get in the way of straight though traffic and excpect the left turners not to get in your way. As for turns on red lights, Queensland briefly considered left turn on red but rejected it because of US studies showing a 30-100% increase in pedestrian crashes and a 20% increase in other intersection crashes. By contrast, when we changed our give way rule in 1993, the reduction in intersection crashes was nowhere near that. It was something like 3.3%, and I suspect that under the old rule, there would have been collisions involving interstate drivers unfamiliar with the rule, since Victoria had a different give way rule from other states. Not really, you disagreed that left turn in red creates as much risk, and I gave evidence to the contrary. What I am saying is that just because we did it does not mean New Zealand should follow suit, given that Australian road rules standardisation is not an issue for them, at least not directly. Just because Victoria saw a decline in intersection crashes when we changed the rule does not mean the same will be the case in New Zealand, especially as the root causes are uncertain. I’ve read elsewhere that New Zealand experienced a lot of chaos at intersections *before* the current left turn give way rule was introduced. Hi CAM, I am the author of the blog posts and podcasts that MYRTONE has referred to. Let me summarise my views for you. First of all, I am not specifically opposed to *either* variation of the rules. Each has its own advantages and disadvantages. What I am opposed to is the reasoning being used to try to bring about change. The NZAA themselves seem to have the worst arguments and that is what I debunked on my blog. The simple premise behind their reasoning is that Kiwis do not know how to drive properly. I happen to agree with them, but changing rules from something many don’t follow to something else that many won’t follow won’t stop those idiots from causing crashes. The central point in my argument is the definition of “give way”. The way I treat it is that I want to make it virtually impossible for anyone to hit me. I think that’s a good way to think when driving. For example, when you use a (non-light controlled) pedestrian crossing – do you step out in front of traffic *assuming* it will stop? Or do you stare right at the driver and be sure he’s going to stop before you set foot on the road? I do the latter EVERY time I cross the road, at controlled intersections too. Being in the right doesn’t make it hurt any less when you get hit. And so it is when driving through intersections. If you drive in New Zealand, you have to be prepared for idiots. Drive so you won’t get hit and follow whatever rules are in play *when it is safe to do so*. I apply the right turn rule every day when I drive home from the railway station after work and I’ve never even come close to colliding with anything. That includes dealing with idiots who push their luck and I am turning across the rush hour stream of traffic, so there’s plenty of giving way taking place. I definitely hear you about giving way. I guess that simplifying the rules can’t hurt though. There are a limited number of situations where the right-hand turn rule makes it quite difficult on the driver – generally difficult for the left-hand turner, not the right-hand turner. Nonetheless, considering the alternative doesn’t seem to have noticeable consequent downsides (perhaps a slight increase in delay for right-hand turners) I think the change is a pretty good idea. Particularly considering the astonishing number of tourists on NZ roads. Anyway, of course the roads would be a whole lot safer if everyone was more alert, considerate and not so very assertive about their “right of way”. I respectfully disagree. Here, I just apply the “can he hit me?” rule. Having to look behind and ahead for traffic and to the left for a clear road to enter makes me acutely aware of my surroundings. This good situational awareness should lead to less risks and mistakes. As the rule stands today, BOTH drivers need to assess the situation fully before making a move (and indeed the following straight-through traffic). This is a shared workload between the drivers. With the proposed rule change, a left turning driver may be lulled into a false sense of security as he does not need to give way to ANY traffic when turning into the trunk of a ‘T’. We all know the role complacency plays in NZ driving. By the AA’s own admission, the guy turning right is going to ignore the rules (as the left turner does today, they say) and go anyway. It’s the same boot on the other foot. As to the number of tourists, I would counter that (a) there aren’t that many on our roads as a percentage of total road users, much less if you discount people from the USA and Europe who already have to cope with driving on the wrong side of the road (a far bigger load on the driver), and (b) there are other rule differences between countries as has already been discussed, so this is but one of several. If this were the only rule difference then I could see it being a problem. There is also another factor to consider. 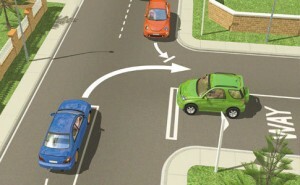 Many drivers will deliberately pull to the left, half into the corner, leaving following traffic a clear path to continue, probably in the belief this promotes increased traffic flow. In fact, the greatest and smoothest flow of traffic is achieved by a left turning driver actively addressing safety by ensuring they turn on their indicator in plenty of time and slowing while still blocking following traffic – allowing the right turner an obvious and safe gap to turn in. I’ve a funny feeling we’re not going to be able to change each other’s opinion! 😛 I do appreciate a debate to thrash out the issues a bit though, so thanks. If I were a decision maker, my priority would be to reduce the overall workload on drivers rather than keep it complicated to keep drivers on their toes and/or for fear of the transition period. One last point on the left-hand turner: After the change, even if careless right-hand turners might ignore the rule, the left hand turner need pay attention closely only to what’s happening in front of them, left or right. As it stands today, they must needlessly pay close attention to what’s behind them as well. Better still, once the transitional period has passed, left-hand turners can pay close attention to potential pedestrians crossing as they turn, or cars emerging from driveways or whatever else may be happening around that corner. They should also pay some attention to what’s happening to their right and behind them as you say. They just don’t need to worry quite so much about it. But! Having said all that, we both agree that being situationally aware and driving defensively should be a priority for drivers’ behaviour. This rule is really a very minor issue compared that that broader one. Exactly. So why is the government wasting time on the minor issue of a give way rule (especially given the massive amount of misrepresentation it is being given – they are actually changing TWO rules) when the actual problem is one of driver education and responsibility? Of course the simple answer is that the real solution is too hard and unpopular. Two things politicians will always shy away from. So I say, driving only from 18 years of age. Far more comprehensive testing – every 5 years for all drivers. No full license (with attendant restrictions) for two years, reducing to one year if you undertake and pass a professional advanced driving course. The AA also claims that people who signal left but continue straight is a reason for a rule change, when in fact that is another sign that driver education is a major issue in New Zealand. If someone signals *right* but then doesn’t do so, that is similarly dangerous and this will remain so even under the new rules. It’s like the NRMA claiming that people signalling left but not doing so is a reason for taking down those LTOR signs. Similarly, in the safer journeys document, Steven Joyce, who should be a man of insight and reason, claims that people not indicating before they turn is a reason for altering the give way rule for pedestrians. It would be interesting if any Brits, Canadians, Australians or even Germans can see the stupidity in New Zealand’s minimum driving age of only 15 and the pathetically short learner’s period. And the permitted BAC is 0.08 whereas here it is 0.05. In some European countries, it’s even lower. Absolutely – 15 years? Short learner’s period? Ours is 16 and the learners’ period is very strict, with a learning curriculum provided for the benefit of a teacher. It’s not possible to obtain a full license until you are 20 here. It was tedious to go through, but I think it’s a good idea in retrospect. And yeah, 0.08 disturbs me. By the time I’m at 0.08 I’m sure I’d be noticeably impaired from driving. I mean, based on using pub breathalyzers, I can even notice the effect of 0.05. Don’t forget that the Northern Territory used to have least stringent driving rules in Australia and was even worse than New Zealand. Learners only needed a single day of learning to drive before getting their license. They only recently introduced a demerit system even though all other states and Territories have had them for nearly 40 years. True, true. I’m sure these are contributing factors to the Territory’s record as Australia’s least road-safe state. It’s not about safety. It’s about flow. I don’t think it has a significant benefit on traffic flow though – the vast majority of traffic proceeds straight ahead at most intersections and right turning traffic must still give way to it. I don’t get the point why anyone would introduce a road rule that is NOT for safety. Two cars stopping to turn into the same road is just one too much. The car which makes the easy turn therefore becomes a potential danger for following cars which might not be aware of sudden yielding. But if the Government really wants to change that rule – as it was on the news recently (http://www.stuff.co.nz/national/politics/3402039/Right-turn-rule-set-for-change) – the real confusion will start. Ahahaha I’m pretty sure that’s the stupidest thing I’ve ever seen anyone get patriotic about. The rule was mentioned on the grey means go blog. Stupid fools who defend this brain dead give-way rule. Many of theme here unfortunately, just watch them fools at a roundabout, they have no clue on how to use it despite not knowing much else but roundabouts as traffic control tools. Kiwis are stuck in a time-warp in the 60s, all about dreadlocks, mullets, pot smoking, doing drugs, getting sloshed and general anti-establishment behavior. And since they had a hippy government which allowed them to get away without punishment for crime, non-acceptance of responsibility and behaving like spoiled kids they have lost the ability of reasoning and common sense. So what else can you expect from them re the argument around this stupid rule.? And now for something more sensible: This rule requries left turning drivers to make greater use of their visual field for a reason explained in situation one, and this my be difficult for those with tunnel vision. The rule also requries more precise distance judgement to apply becuase the priority is variable in relation to how vehicles are approaching. The blue car may get to slip round the corner because the the red car is compelled to wait for the yellow one, otheriwise both drivers may be unsure what the other will do and both wait, unless impatient enough to take risks. *Monocular vision – note that being sighted in both eyes does not mean one can see 3D, this can depend on cogative capacity to peceive true depth, as opposed to monocular depth cues. Must say at first i thought it was stupid but reason why they give way to right is because if someone makes a bad call there won’t be a big impact on the driver whose in control of the vehicle because if in any case of an accident the passengers side would be hit instead of the drivers side. Fair enough – but shame about the pedestrians who get run over while left-turning drivers are looking for oncoming right-turning drivers. Note my point about visual impairment, I suppose that drivers with ony 140deg visual field more likely to hit pedestrians while watching for right tuning vehicles than are drivers with 170 degrees visual field. The latter is the normal human visual field and the former in the minimum for driving in New Zealand, whether for personal or commercial use. But then again, could it be that plenty of NZ drivers don’t know the mirror signal maneuvere? Also see My comment here. So finally we are going back to how the rules used to be here in NZ. Someone tell me that it wasn’t. We are going back and we should have done the switch back in the first year. The argument for our “stupid rule” at the time was that it would improve traffic flow. Not much else said as to why. We got it, we hated it from the start, old people never got it, still don’t. Many supposedly intelligent people cant make judgements that the car coming behind them will not be turning left so no point sitting there like a dummy. I must be old or something, nowhere has it been said that we are switching back just that we are introducing a new rule. Sanity prevails! New Zealand’s right hand turn rule changes to align with the rest of the western world on March 25th at 5am. See here: http://www.nzta.govt.nz/traffic/around-nz/road-user-rule.html. I leave this post as a testament to how silly this rule was. I did a search on “Stupid New Road Rules” when I saw today’s paper detailing the new changes, and found this site. All the giving way rules so far make sure that if the driver’s door is at risk then he/she gives way. From now on we can look forward to an increase of injury accidents where the injured driver gets the blind corner of the offending vehicle ploughing into his door. 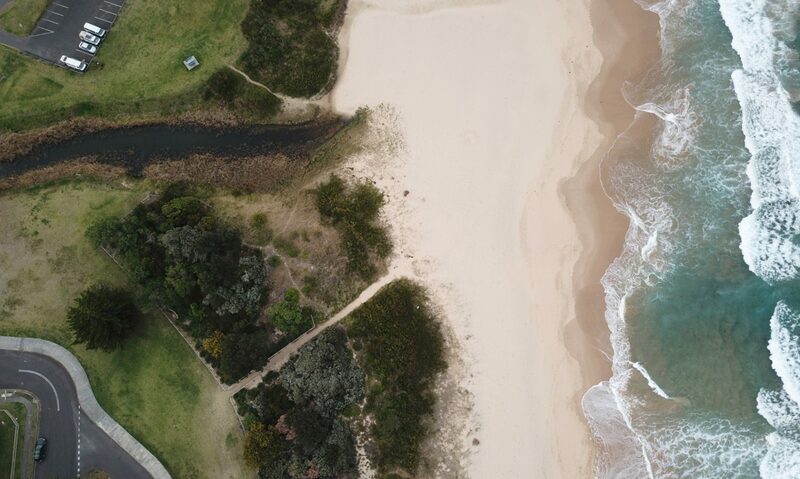 I spent several years driving a truck in Sydney’s nightmarish traffic, and turning right was to be avoided at all costs. You’d sit exposed and vulnerable in the middle of the road for light change after light change, hoping for a break in the traffic. It was this that gave me the idea of pillar-mounted indicators back in the mid eighties. The moment you saw a hint of a right indicator in your lane, you had to dive into the centre lane or wind up in a stalled queue behind the right-turning vehicle. Our laws in NZ until now have been merciful and fair to the right-turners, now their odds of getting across the road have been almost quartered, leaving them stranded and blocking their lanes, while the left-turner finds an easy task made easier. Side impacts are very dangerous regardless of which side of the vehicle is hit. The lateral forces generated do serious damage to people at low speeds. The NZ AA estimated that the previous rule was a factor in “one or two deaths each year”. The “protect the drivers side door” idea is an interesting one, but that it improves safety is not borne out by evidence. The point about it making right turns take longer is an interesting one. Still, with the vast majority of traffic proceeding straight ahead at most intersections, I can’t imagine the old rule made a huge difference there. Then again, I’ve done very little driving in NZ. Thanks for your comments. I have been driving over here for 34 years and to tell you the truth I’m not looking forward to the change, not only the struggle for everybody to get used to the idea. After driving and being driven in Australia, USA, Switzerland, Germany, Italy, Israel, Vanuatu, India & Fiji I have greatly appreciated the NZ way of showing mercy to the right-turner. I guess it’s mainly our delegated global village role of tourism that is the main reason for ditching our unique and better ways of doing things for the benefit of overseas visitors/immigrants. See Allister’s comments above, there is a consensus but he disagrees. As I remember an Australian State (think it may have been Victoria)changed there right hand rule 30 odd years ago so that people turning left had to give way to right turning traffic. The Australians found it didn’t work too well and changed it back to how it was. Good old NZ took another 30 odd years to change it back to how it used to be. The transition went very well as people were driving cautiously. According to statistics intersection accidents have decreased. The main cause now is red light runners. So we may be slow in NZ at changing things but we eventually did it so now tourists won’t be confused by a different rule. And with a shift to Australia (to check out my fathers side of the family) at least I won’t have to re-think at intersections. I’ve just been in NZ again for a couple of weeks, driving around (and skiing a bit). It really was a lot more relaxing as a visitor not to have to think about the different rule. Being that 3/4 of Queenstown’s winter population is Aussie, I’m sure it used to be occasionally hairy. We changed in 1993, it used to encourage people to drive in the outside lane, especially as left turns (then as of now) were only permitted on a green light thought Victoria.